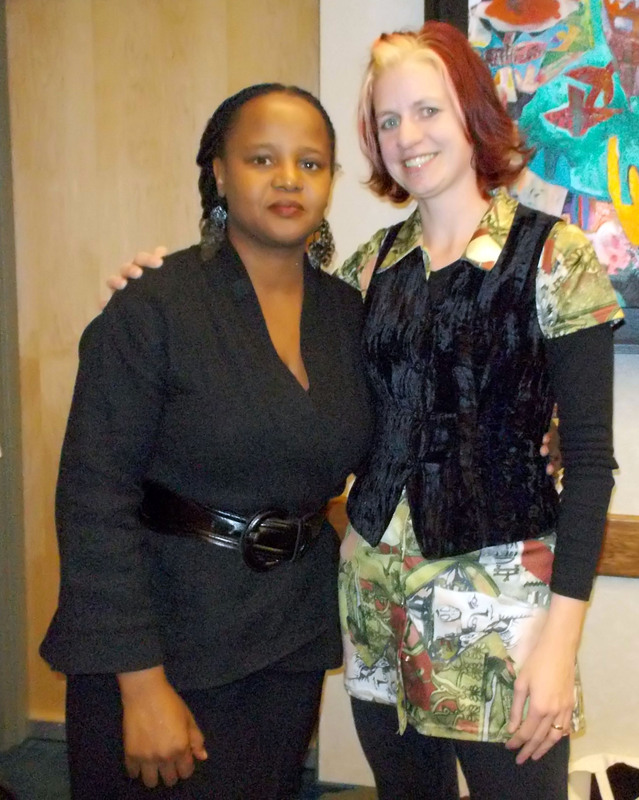 Me and Edwidge Danticat. Authors are like my rock stars. My local university, Minnesota State University-Mankato, is host to the Good Thunder Reading Series in which top-notch authors visit the campus to speak to students, give a talk on craft, and deliver an evening reading. I’ve been attending these events for years and cannot properly explain how fortunate I feel that these authors are in my back yard. If it weren’t for the Good Thunder Reading Series, I would have to travel to Minneapolis-St. Paul to see this caliber of authors. Recently, Edwidge Danticat paid us a visit. Danticat has been nominated for a National Book Award and is the recipient of a MacArthur “genius” grant. A previous visitor this season, Alison Bechdel, is also a MacArthur grant recipient. Rick Robbins does an excellent job of choosing authors! Story ideas are like bits of lightning. If we weren’t writers, we’d all be raging at something. We’re able to take those emotions and put them on the page. You’re going to create characters that you don’t like much, so try to understand their point of view. What’s making them unlikeable? Get a sense of the character’s “intellectual map”—imagine them living next door to you. Try to come up with surprising combinations for your characters. This will make them more three-dimensional. Be forgiving in your writing. Trust yourself more. Hook the reader right away, but avoid gimmicks in doing so. Pay attention to endings. Danticat read the last line from James Joyce’s short story “The Dead” and from Gabriel Garcia Marquez’s One Hundred Years of Solitude. There’s a heaviness and vastness in the final lines, the final words. There are many writing advice books out there, but so many focus just on writing, as if there are no other aspects to the writer’s life. Danticat’s favorite books about writing are Annie Dillard’s The Writing Life and Anne Lamott’s Bird by Bird because they focus on how writing fits into a life. Danticat writes the silences, the people who haven’t had the voice to tell their stories. There are things not being said, things not being talked about. When you’re stuck, put other stories in your head. Read. Go to a movie. You will find yourself writing in the times when you’re not actually sitting down to write. Edwidge Danticat! How wonderful. Thanks so much for posting your notes… motivated by every line. You’re welcome! Edwidge Danticat was very motivating! I’m so glad I had a chance to hear her speak. “If we weren’t writers, we’d be raging at something.” – oh, that’s good! Isn’t it true, though, that art does so much for inside before it ever reaches the outer world? So true! Personally if I didn’t write I would go crazy! I would always write, just to make sense of the world. I have pages and pages of journals that will never see the light of day. It was more writing in order to work through things. Great picture and great notes – thanks for sharing! We are lucky to have so many artistic outlets in MN. I completely agree! We don’t have to travel far to see great authors. Cool, Rachael! I love Good Thunder. Just wish I made it over there more often. Thanks for the notes! You’re welcome! It’s been a great line-up already this year.